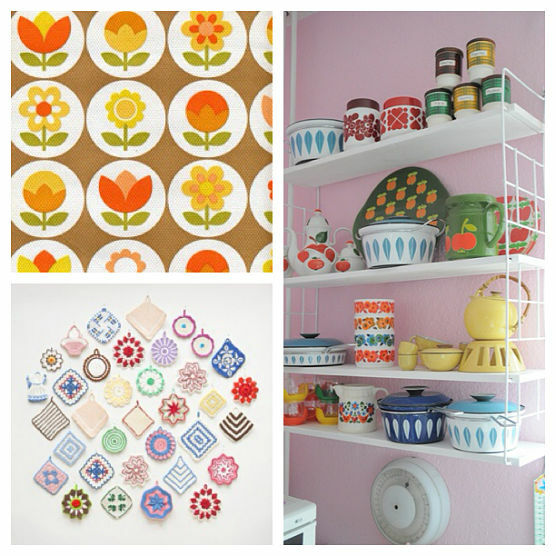 This week I’ll be setting off on my first thrifty adventures of 2014 and I’m sure looking forward to filling up the online shoppe with fresh vintage finds. Follow me on Instagram for the early birdie sneak peeks! I have enjoyed running Thrift-ola since it’s launch in Spring 2011 but the one thing I haven’t quite managed to do is give it my full and undivided attention. During the past few years I have freelanced for the Vintage festival and spent the majority of this year as Head of Marketing for Rokit Vintage. 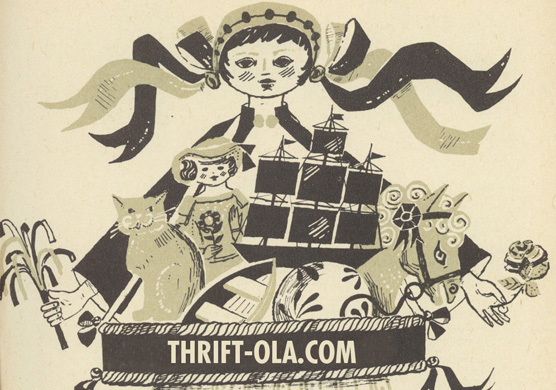 This is all set to change in 2014, as I embark on a full time Thrift-ola adventure which will see me sourcing fun vintage from all over Europe and also dusting off my designer/maker hat. I’m excited and I hope you are too! Thanks for all your support so far and here’s to a super-duper 2014! Last postage dates for Christmas. 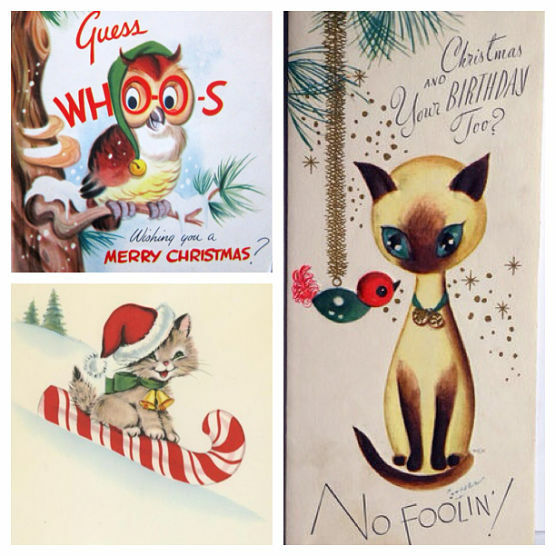 If you’re still on the hunt for stocking fillers and Christmas pressies and wanna go vintage then you have the rest of this week to snap something up from my online shoppe. 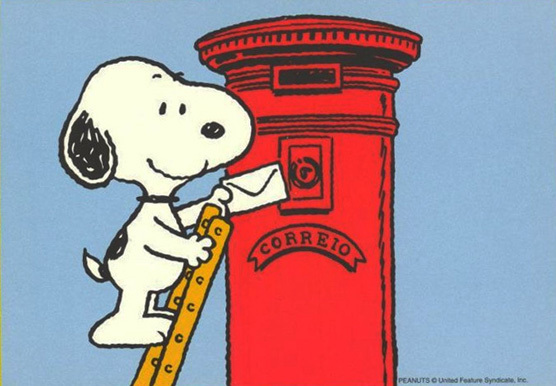 • UK first class post – please place your order by THIS Friday 20th December at midday. • Last chance saloon! UK Special Delivery – please place your order by Monday 23rd December by 10am. 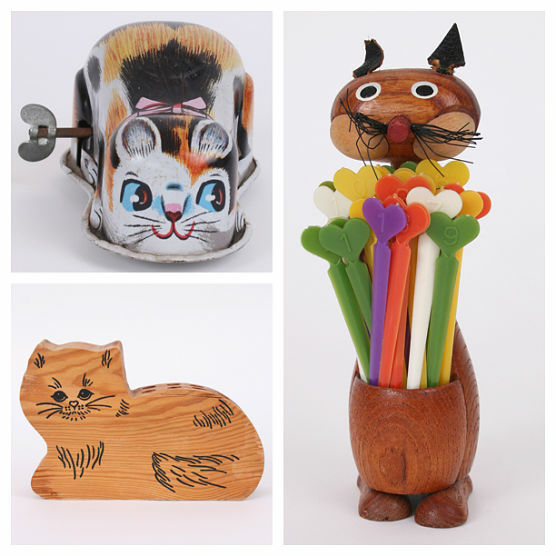 Vintage kitty cats for sale on Thrift-ola. 1, A 1960s Japanese wind-up tin toy with big doe eyes and a sweet pink bow. Wind it up with the original key and watch her scamper across the floor! 2, A 1960s Danish teak cocktail stick holder filled with original plastic picks, perfect for canapés and cocktails alike.